Just a few short years ago, if I ordered a salad at a restaurant and it arrived at the table topped with any kind of nut sprinkled on top, I would immediately pick them out with my fork (or, let's be honest here - my fingers) and pass them over to Hubbers with a grimace and a shudder. Most of the time, unless the other ingredients in the salad were just too hard to pass up, I'd likely avoid ordering it altogether. For most of my life, the only nuts that I've really ever considered palatable, were peanuts and cashews - and that was only if they were plain and straight from the bag or can... definitely NOT mixed into or plastered onto the top of something; especially sweet treats like cake - or cookies - or God forbid... brownies! Eeeeeek! All of that changed when I received the "wrong" salad at a local restaurant a few years ago. I'd ordered the "blue cheese wedge" salad, but what the waiter brought out to the table and placed in front of me, bore absolutely no resemblance to that classic steakhouse staple. It did have blue cheese sprinkled on it, but instead of bacon, scallions and a nice thick, creamy blue cheese dressing, there were chopped apples, dried cranberries, a vinaigrette of some sort and much to my shock and horror, (insert "DAT, DAT, DUHHHHN" here)... spiced pecans! Now, the hubby was more than happy to take them off my hands, but encouraged (read: pestered) me to at least try one before he did. So, I thought about it for a minute and I figured that it certainly wasn't going to kill me. You never know, right? It wouldn't have been the first time that I'd tried something that I thought I wouldn't like and instead, ended up thoroughly enjoying it. Pre-heat your oven to 350 degrees Fahrenheit. Add your brown sugar, spices and salt and combine thoroughly with a whisk, spoon, or mix them together with your meticulously clean fingers. You should have a fairly smooth paste-like consistency. Add the pecan halves and mix them with the sugar, oil and spices until you have them all coated well. My mixture was a tad lumpy due to the cold coconut oil, but it still worked out fine. I just used my fingers to pack or press it onto some of the pecans to make it stick better. If your oil is more liquid, a spoon will do the job. Spread the coated pecans out in a single layer on a parchment lined baking sheet or pan and toast them in your pre-heated 350 degree (Fahrenheit) oven for 3 to 6 minutes. There's no need to take them out and turn them, but you can do it if you don't feel like they are toasting evenly. A batch of this size usually takes a total of about 5 minutes, but since ovens can differ in temperature, you might need to take them out sooner or leave them in a little longer. Just be sure to remove them as soon as they've turned a a slightly darker golden brown and you can see the spice mixture sizzling or bubbling a wee bit. Remove them from the oven and set them aside to cool thoroughly. (at least 10 minutes) The sugar and spices form a yummy crispy coating as they cool. You had me at pecan! I eat them plain by the handful along with lots of other kinds. LOVE nuts! Always have. We collected, dried, hulled, cracked, picked and canned black walnuts from trees on our own property from the time I was a kid. Great family activity! 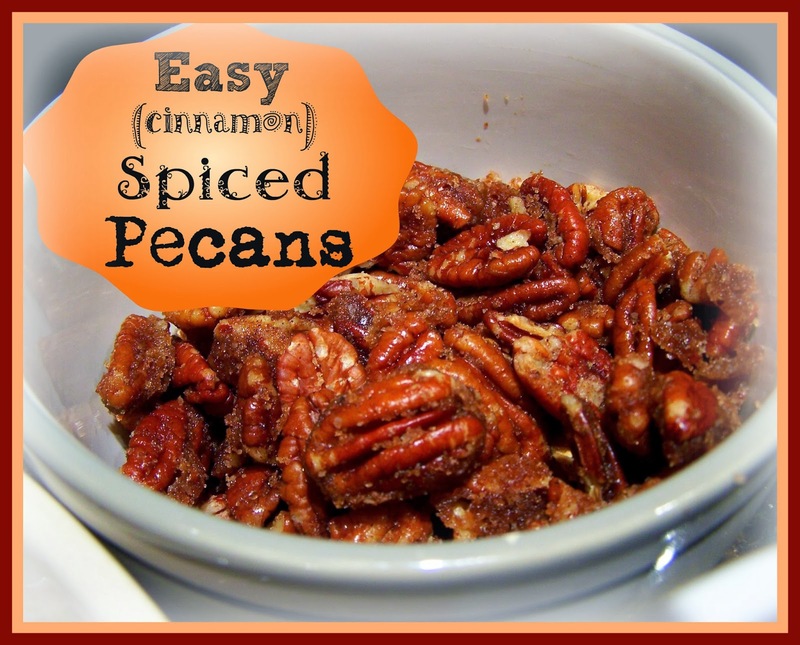 I like spiced pecans, and this recipe would make it easy and less expensive to have around for the holidays. AND they'll be great in chicken or turkey salad!!!!!! Right on time with this recipe! I haven't been online much lately, but easing my way back now. I hope you are feeling 1000% now and being a good steward of your full recovery and continued good health. For me, it's been a little tough to do that, but my deal wasn't nearly as serious as yours!!!!! Take care, my sweet, and have a wonderful Thanksgiving!!! Mary, I have never met a nut I didn't like, and pecans are probably my favorite. Your Cinnamon Spiced Pecans sound delicious. These would be so good for little gifts this time of year....um, if I can part with them... :) I really like that you added just a touch of cayenne. I bet these smell fantastic while they bake! Pinned!